You can watch it here on vimeo, or go to the Media section. One has to listen to the immensely remote in order to better perceive the infinitely close. 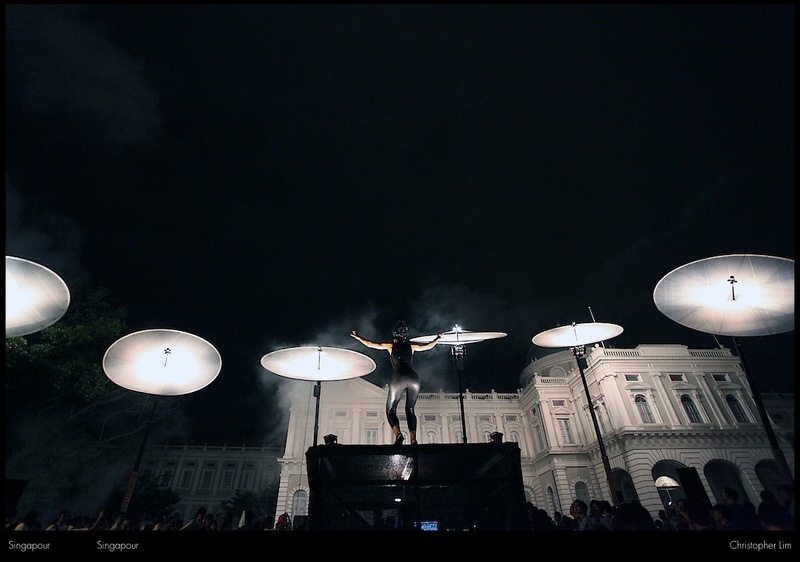 The telescopic arms of the apparatus stretch towards the sky, lifting the dishes up to their listening position. The receiving surface of the antennae is lit by a nacre glow and at their centre a bright strobe signals their activity. They seem to pick up the sound of the stars, which they then broadcast back down to Earth, from a sound system featured at their extremity. 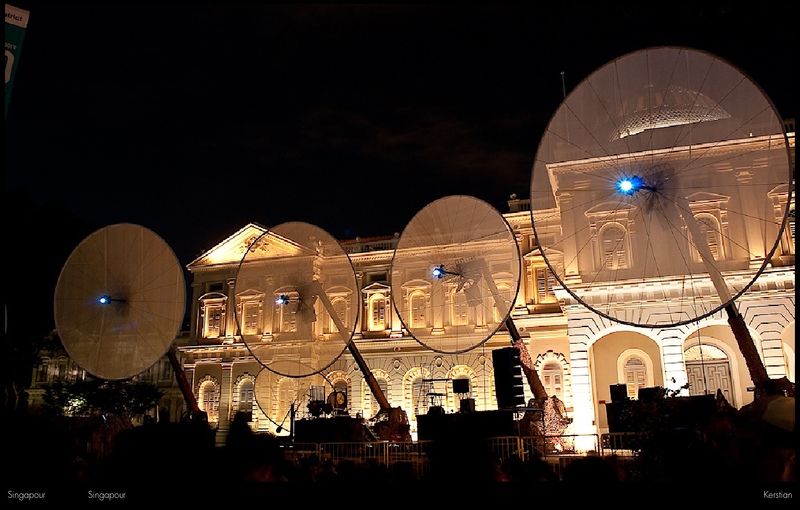 When, finally fulfilled in their quest for celestial elation, they decide to look down towards the Earth, the telescopic arms withdraw, the dishes bow down towards the vide-projectors’ axis, and the audience, standing up within the elliptic setting thus created, become receivers. 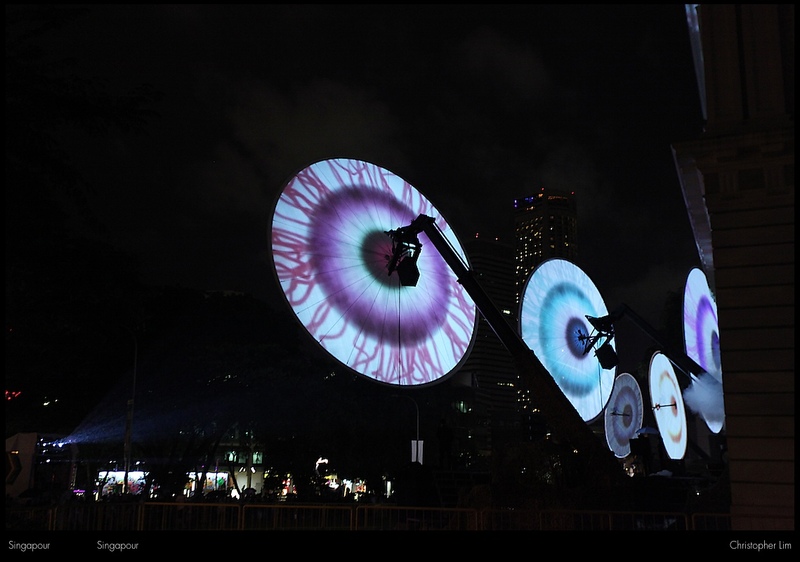 A monumental urban installation, "Paraboles" was first and foremost conceived as an artistic "container" which could integrate various artistic proposals by multimedia artists. 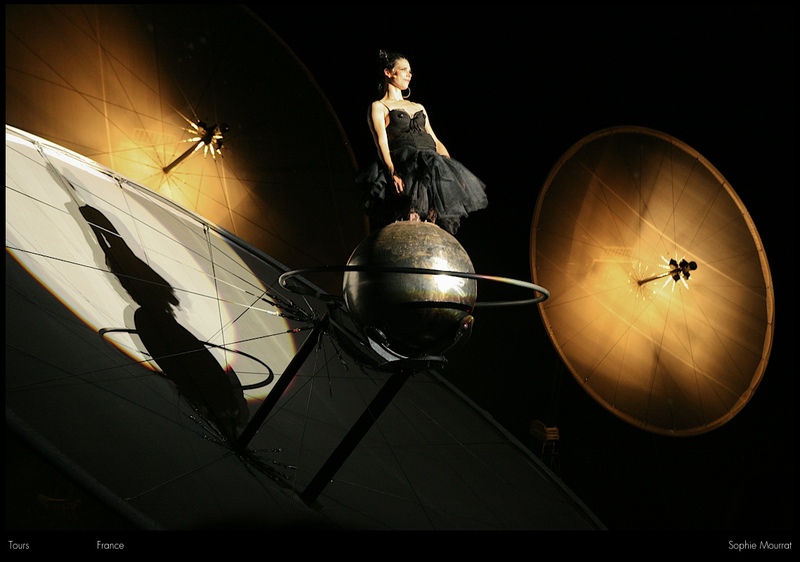 The first occurence was "Paraboles 1.0" in 2007, created for the Nuit Blanche in Paris, and based on a musical and visual creation by contemporary composer Julien Taride and soprano Anne Rodier. 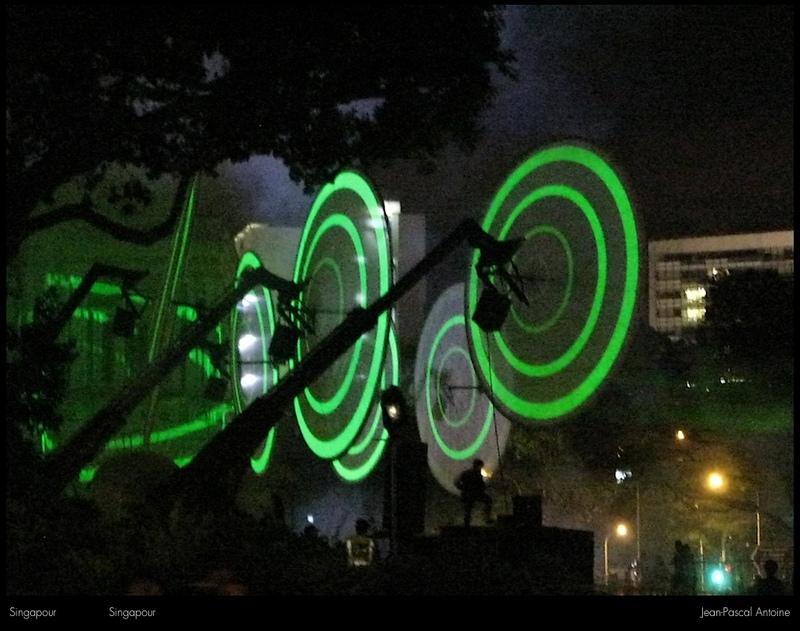 "Paraboles 2.0" was then born in Singapore for the Night Festival in July 2010, with an original video work by Vitric Thng, conceived in close collaboration with the French team. Other creations are under way with the purpose of an on-site artistic fusion. 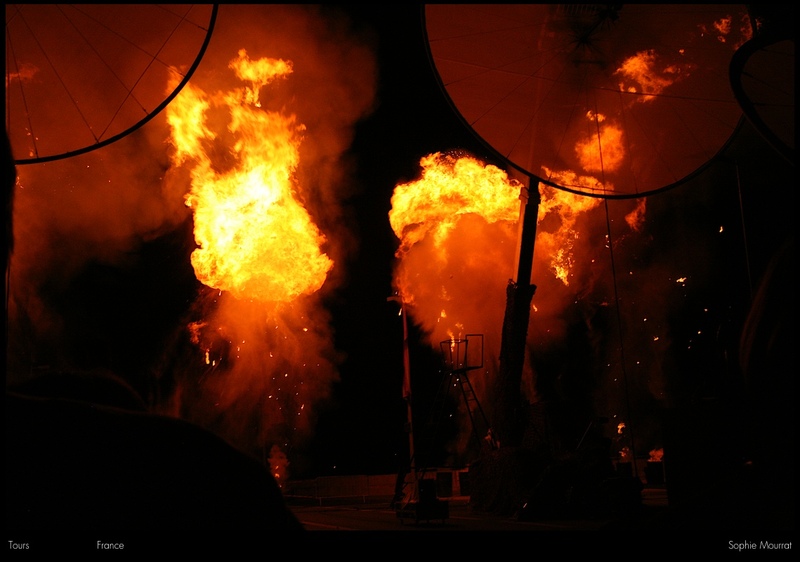 Thus each performance of Paraboles can potentially become a creation in and of itself, as Paraboles 3.0, 4.0, etc. 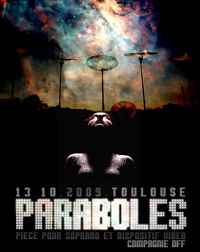 First original creation specifically conceived for the Paraboles, this piece for soprano and video installation was previewed in 2007 for the Aurillac International Festival, before the premiere in Paris within the Nuit Blanche. 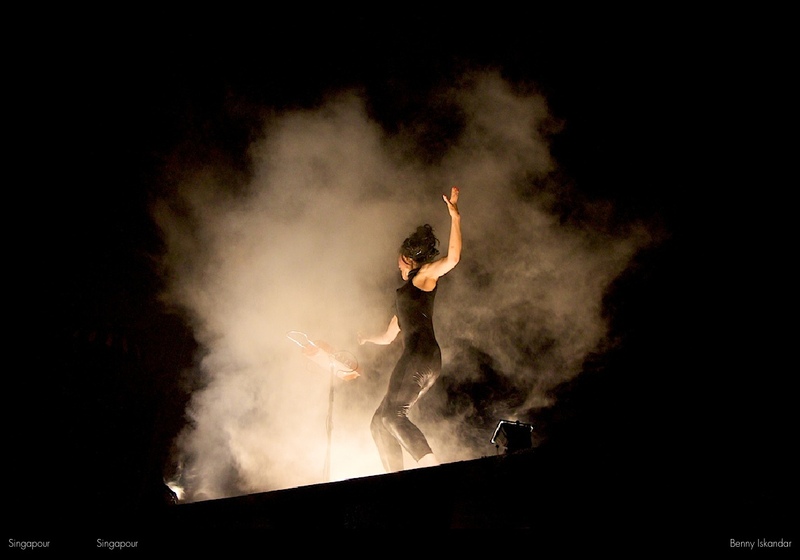 Built around the musical and video work of contemporary composer Julien Tarride, and the vocal interpretation of Anne Rodier, the piece explored the infinite cloning of a soprano in search of her own identities. 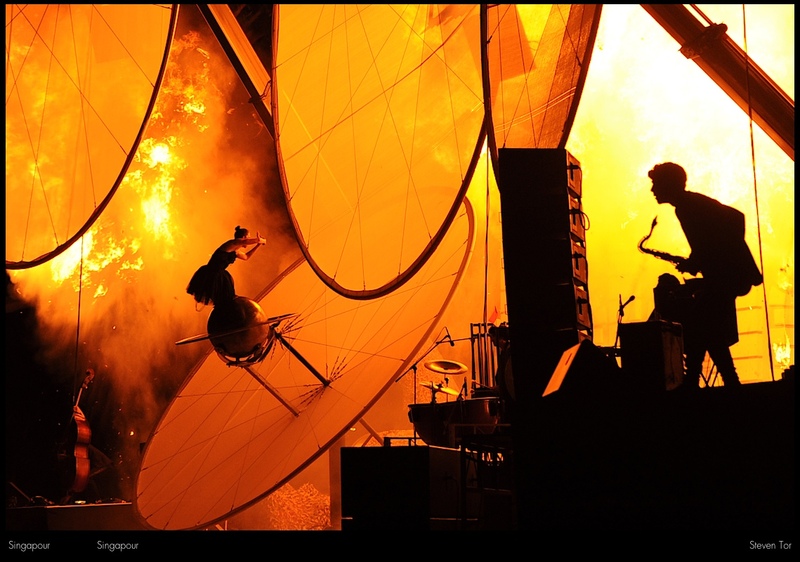 Psychedelic, colourful, sometimes playful, sometimes ominous, these visions of a Universe under construction summon an abstract Conscience in the middle of some creative frenzy, carried away and snatching the actors and the audience along with it inside a no-return whirlwind. 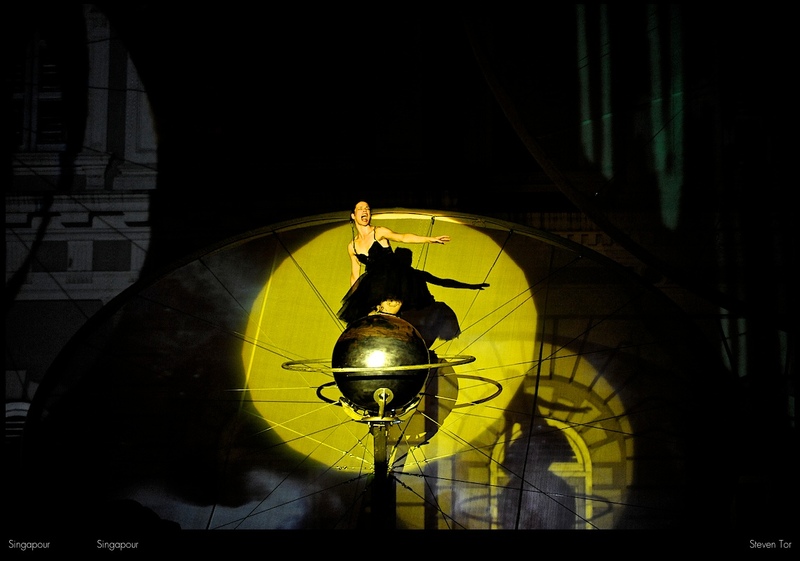 As the human incarnation of the piece, Cécilia Ribault dances, sings and acts. 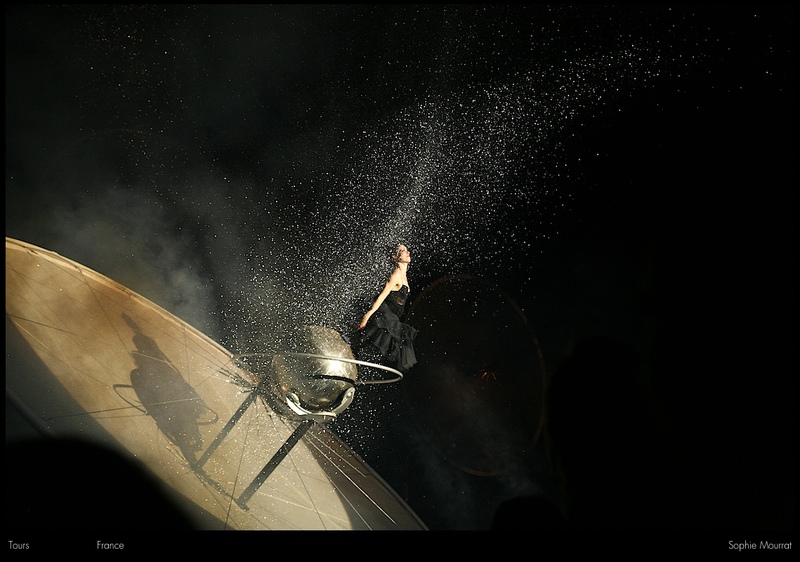 A performer first and foremost, she first appears as an anonymous girl, an everyday silhouette snatched into this fantastic machinery. Confronted, chosen, directed, manipulated, she wavers between self-affirmation and self-dissolution, between the joyful pleasure of a kid at the fairground and the femme fatale struggling to keep some control in the face of the cosmic vortex that threatens to absorb her. 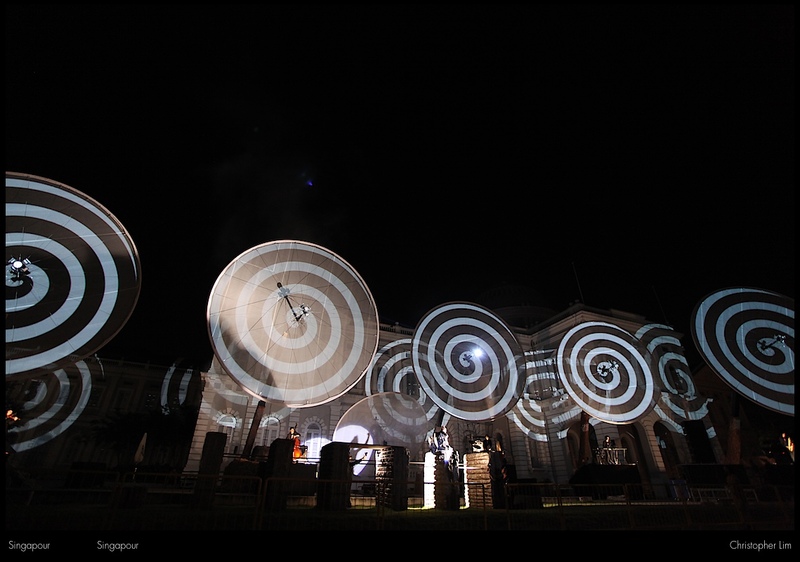 In Paraboles 2.0, Soundpainting is used as primary musical substance, composed live depending on the images projected onto the Paraboles, and perceived by the Conductor. 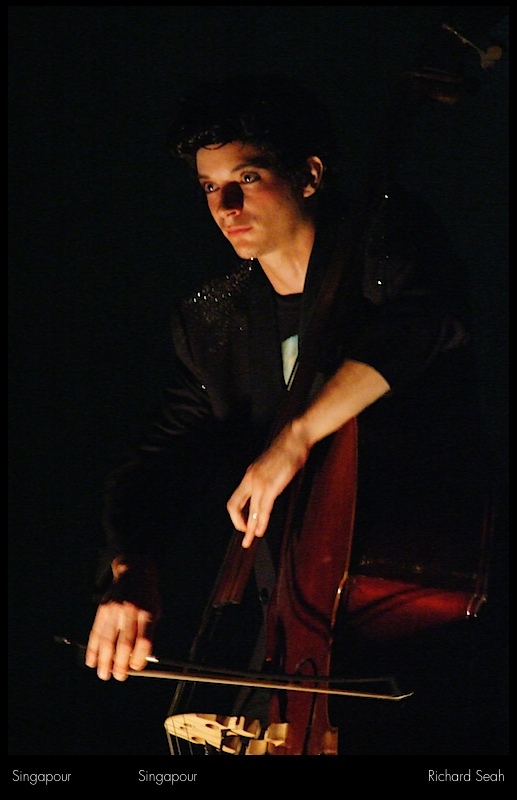 Between written musical themes and complete improvisation, the score is written for and on location. Ever changing, it is however always “framed” within a definite timeline and rhythm. 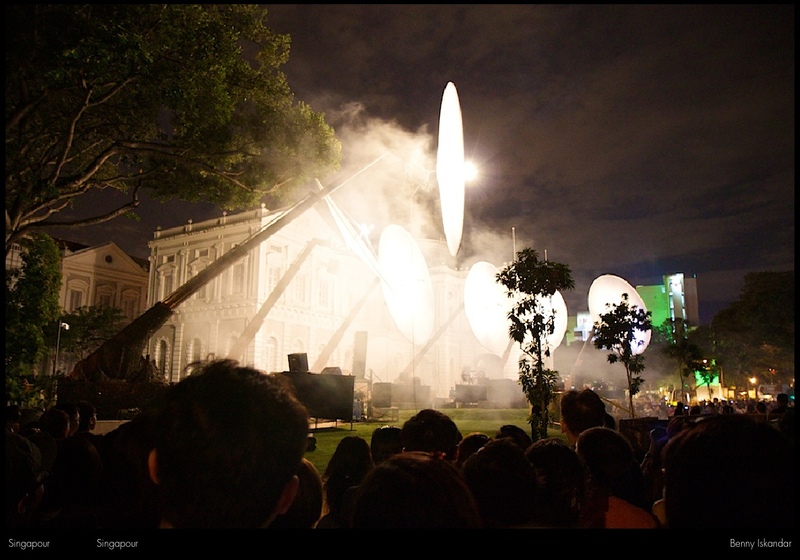 2010 cretion in collaboration with the Museum of Singapore Night Festival. 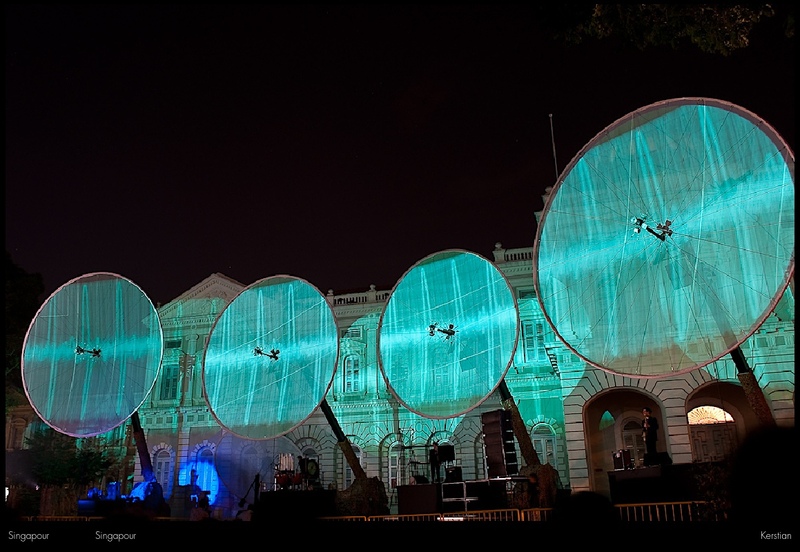 2010: Creation of PARABOLES 2.0 in Singapore for the National Museum Night Festival. 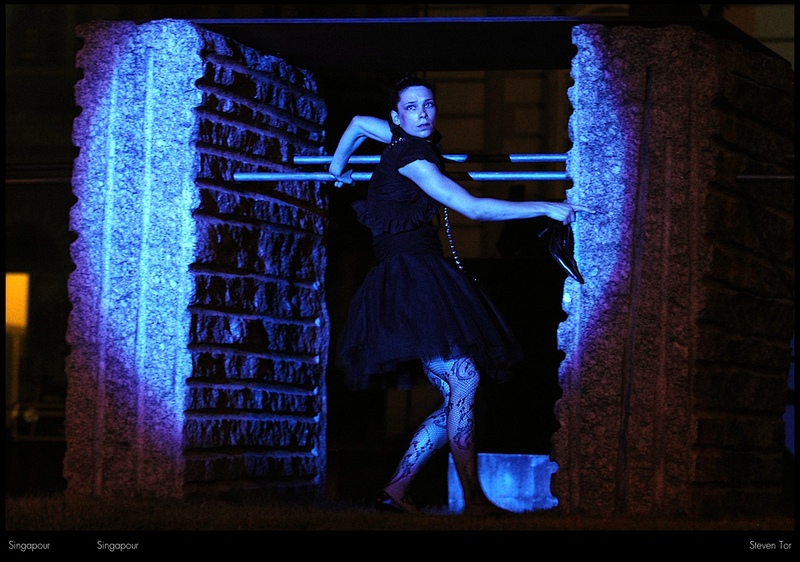 Continuous, before and in between performances. 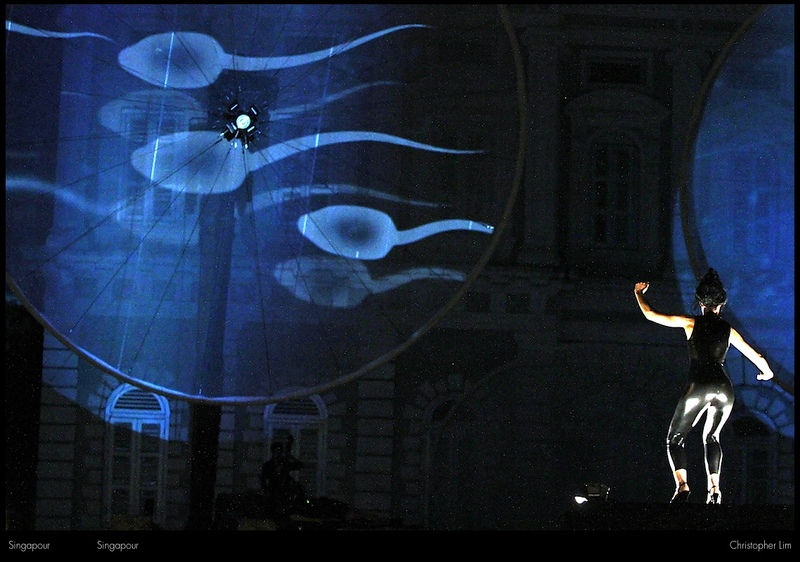 By night, 1 to 4 performances per day. 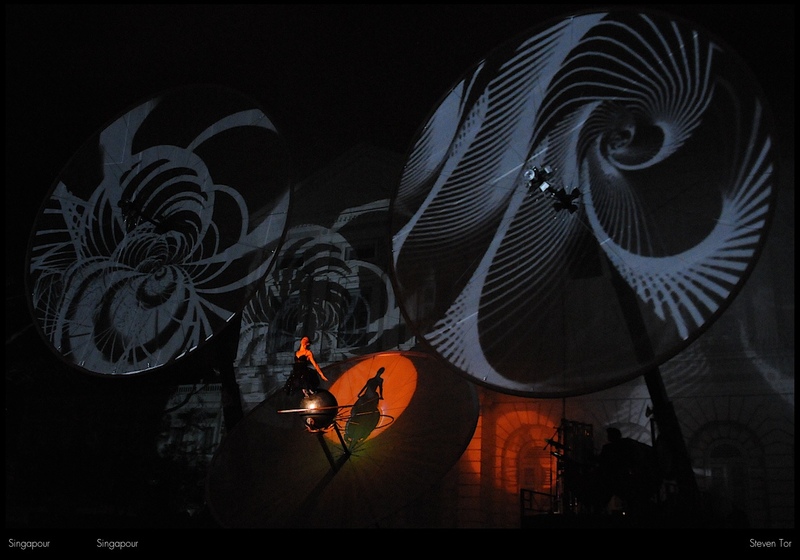 Paraboles 2.0 offers a possible artistic collaboration with a video artist in every location visited. 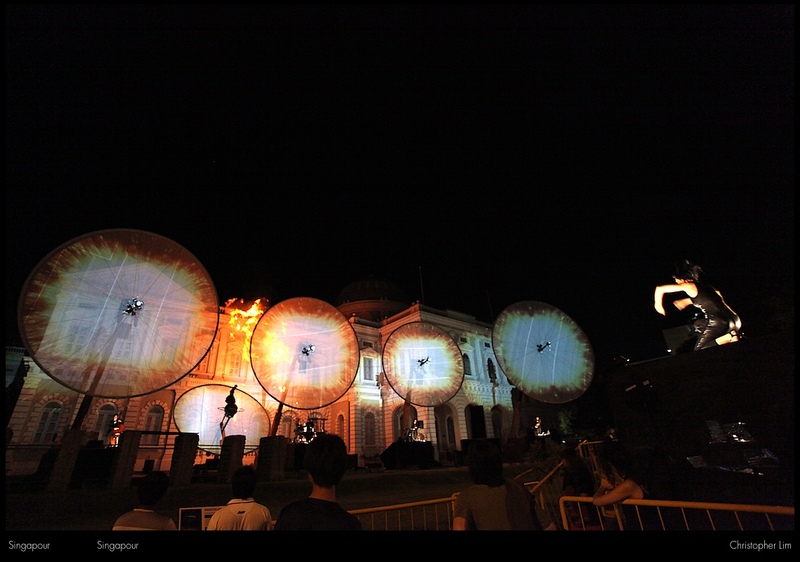 Depending on the performing context, an original video creation can be foreseen with a local artist, while the music and general direction will be adapted accordingly. 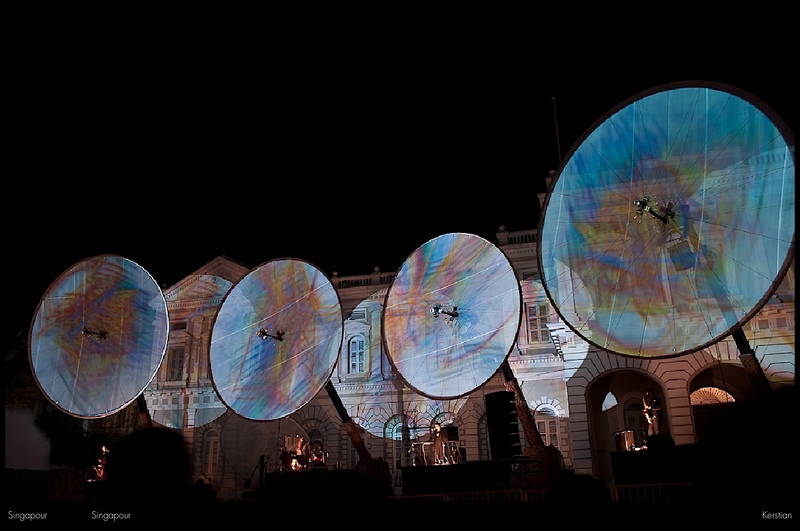 "An aerial - possibly interstellar - wonder, rigorously fantastic. Literally outstanding." 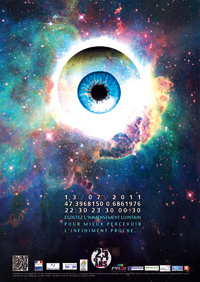 " A mechanical fantasy of enchantes Paraboles. 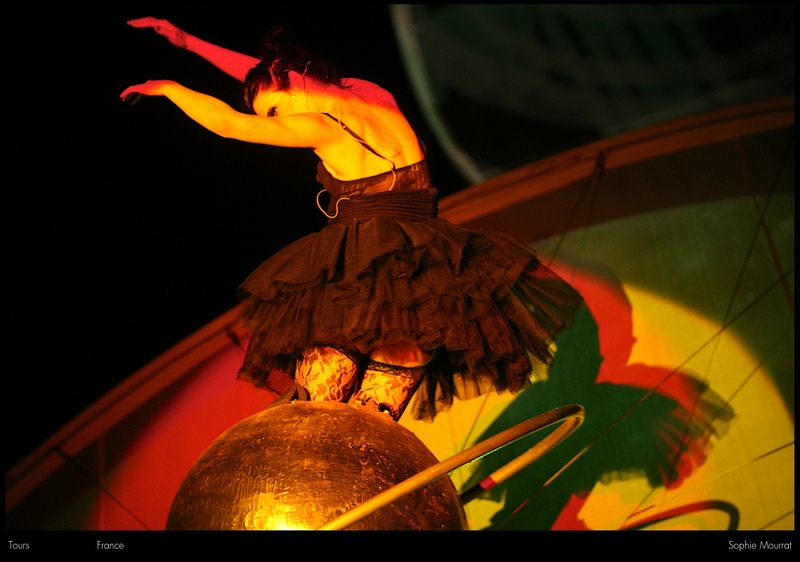 A monumental, fascinating space opera: the audience, captivated, intensely listens and watches. A true creation. " 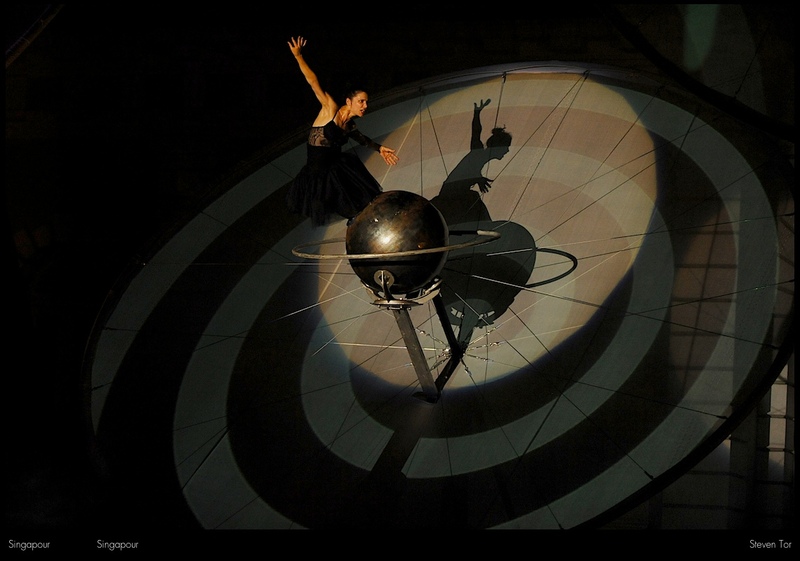 "A finale filled with the music of the stars, brought to the very heart of Salamanca by Companie Off. 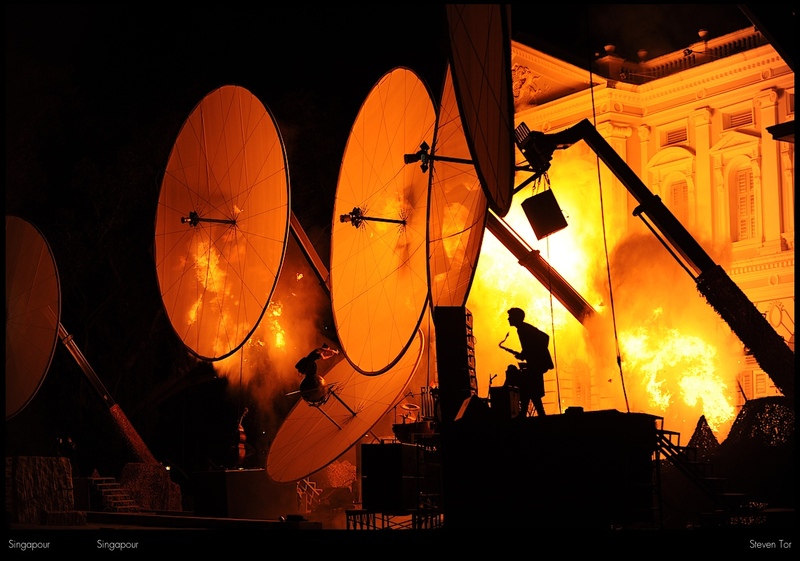 Visually stunning, musically intriguing: a grand avant-garde show..."
"Compagnie Off provided the festival with a huge, colossal finale, and impressed the audience into an ovation, for what was considered the most ambitious street installation of the whole festival. " 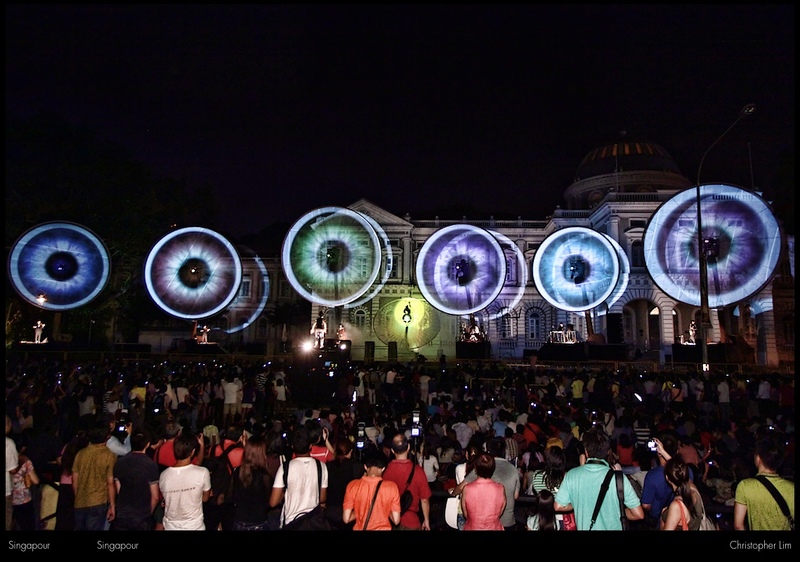 "The sight intrigues and forces the audience into observation, transporting them into another world. It is a little bit terrifying, but most of all it is huge and extraordinary.. "